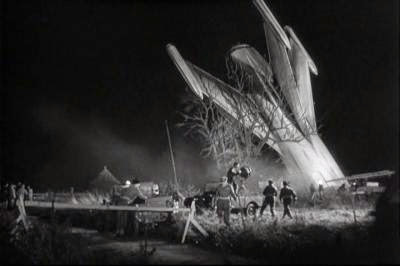 On 26 August 1955, a manned missile, launched by the team led by Prof Quatermass, landed in the English countryside, One mile south of the village of Bray, Berkshire. Of the three members of the crew aboard the craft, two were found to have mysteriously disappeared. The surviving crew member, Mr Victor Carroon was recovered barely alive and subsequently underwent a horrific physical metamorphosis. The surviving crew member managed to break out of medical confinement and, while being pursued by investigating Scotland Yard inspector Lomax, embarked on a killing spree using humans and animals to feed his transformation, It was later determined that this was the method which an alien life form was to use in order to invade our planet. Professor Bernard Quatermass was in charge of the manned rocket mission that crash landed in a farmer's field in the English countryside. The general public were warned to stay away from the area, to return to their homes and not to hamper operations at the crash site. Upon gaining entry to the rocket, it was found that only one of the three occupants, Victor Carroon, was on board while the other two crew members, Reichenheim and Green seem simply to have had vanished. All that was found were just two empty space suits. Newspaper headlines such as “Man Masters Space” and “Quatermass Says No To Police Investigation” soon began to appear. 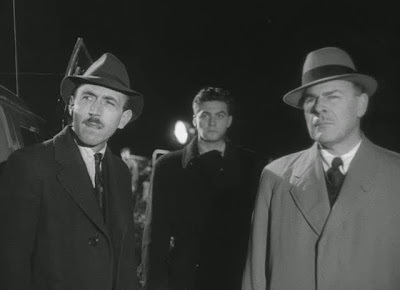 The media reporting of the mystery led to involvement by the police, headed by Inspector Lomax of Scotland Yard with the reluctant cooperation of Professor Quatermass. According to Professor Quatermass, he began to realize that Carroon may have been infected by an alien entity while out in space. The effects of the transformation on Carroon according to Dr Gordon Briscoe were that his skin made one feel that you were “shaking hands with ice.” In addition, his skin was taking on a swollen appearance and his bone structure was undergoing dramatic changes. It soon became apparent that Carroon could no longer be looked after where he was and therefore he was eventually transferred to a hospital in order to be closely monitored and cared for. It was later determined that Carroon had come into contact with a cactus plant at the hospital and that this produced a grotesque transformation in his hand; a form of plant and animal biological fusion within Carroon. The police soon put out an APB for Carroon after he had run off leaving his terror-stricken wife. All members of this Royal Commission of Inquiry have attended a viewing of the film from the space ship. Although rather grainy in quality and lacking any audio, it is obvious that something had infiltrated and disabled the craft, and then killed two of the crew members, while leaving Carroon alive. There was also a fantastic drop in temperature evident at the time. The subsequent murder of a pharmacist at a chemists shop and the slaughter of a number of animals at London Zoo, pointed to Carroon as the one being responsible. From the numerous scientific and professional reports, submissions and expert witness testimonies to the Inquiry, a consensus had begun to emerge as to the probable nature of the alien entity. 1. As the creature mutated, it began to leave a trail like a snail. 2. A fragment of the creature discovered at the zoo indicated that it was self- sufficient and could develop in its own right. 3. The entity was a form of life in space that was “just drifting” when the rocket encountered it. 4. A union between plant and animal life was beginning to take place. 5. In order for the creature to live, it had to have food. 6. The danger was that the creature could self-procreate and multiply, and that within just a 24 hour time period London would have been overwhelmed by a multitude of slithering life-draining alien beings. All members of this Royal Commission of Inquiry have also attended a viewing of the tapes from the BBC Outside Broadcasting unit that had been set up to give a live broadcast on the restoration work that was then being undertaken at Westminster Abbey. At first, vision of a man’s body lying lifeless on the ground could be seen. It was apparent that he had been killed before he fell. Next we witnessed the creature itself atop the workmen’s scaffolding. Little remained of Carroon. All that could be seen on the by then 20 foot slithering mass were scales, an eye, and thorns apparently adapted from the cactus plant. 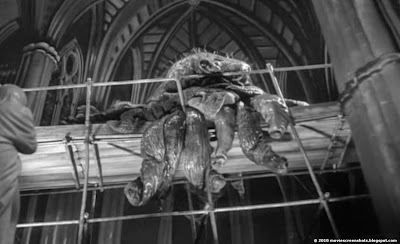 It was eventually decided that the best way to eliminate the creature without the threat of releasing spores across London was to route the entire electricity grid to Westminster Abbey straight to a cable attached to the scaffolding on which the creature was situated. The measures taken to terminate the threat posed to our planet by the creature proved to be successful. However, contrary to Professor Quatermass’ stated goal of wanting to “start again,” the Inquiry would like to draw attention to its assessments and conclusions pertaining to The Manned Rocket Mission Headed By Professor Bernard Quatermass, Also Known As The Quatermass Xperiment and its aftermath. Based upon the numerous scientific and professional reports, submissions and expert witness testimonies to the Inquiry, it has been determined that Professor Quatermass did deliberately and recklessly launch the rocket without official sanction, as pointed out to the current Royal Commission of Inquiry by a Ministry of Defence official. By so doing, he endangered the national security of Great Britain, the very existence of the British Empire and the survival of the entire human race. 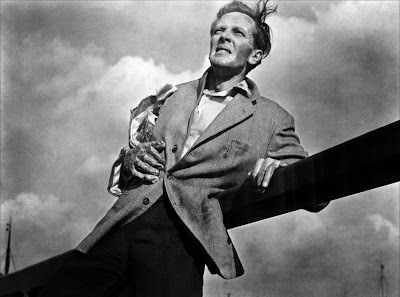 Quatermass’ oft repeated comment that, “They’ll (the astronauts) fire the imagination” indicates that his only concern was for the mission and its supposed symbolic value to humanity for which he would presumably derive full credit. His testimony where he stated the following; “I launched it (the rocket) and I brought it back!” along with “I am the best qualified” (to conduct a scientific investigation) as well as the testimony of other witnesses who reported him as telling them “Don’t tell me what I can and can’t do!” and “Don’t argue with me, I know what I’m doing!” indicate a preoccupation with his own ego and sense of self-worth as well as his belief in his own personal infallibility. 1. All future manned space flights (government, private and commercial) must adhere to a strict set of guidelines in terms of safety, quality control and conduct of mission procedures. 2. A body must be established to oversee and enforce adherence to such guidelines. 3. A set of protocols must be set that deal with contact with alien life forms and any potential threats to national and global security that may arise from such contacts. 4. That Her Majesty’s Government work with other nations’ governments in order to arrive at a consensus for achieving the above measures and that this be formally presented and agreed to at a special meeting of the United Nations to be called for by the end of the current decade. 5. 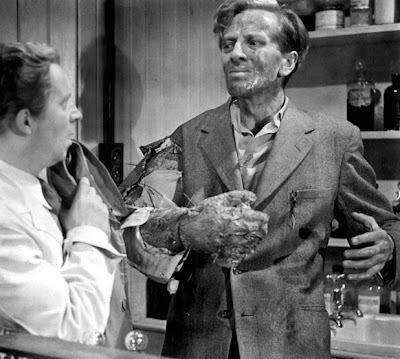 Finally, based on the evidence put forward to this Inquiry, that Professor Quatermass be held accountable for what appears to be criminally negligent conduct in the matter of the manned rocket mission which he headed by requiring him to stand trial in a court of law should it be found by the Attorney General that legal grounds exist for the prosecution of Professor Quatermass. 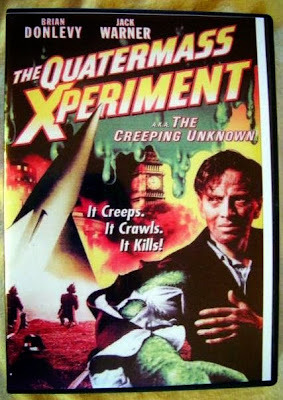 The Quatermass Xperiment was based on the six-part 1953 BBC Television serial The Quatermass Experiment written by Nigel Kneale. 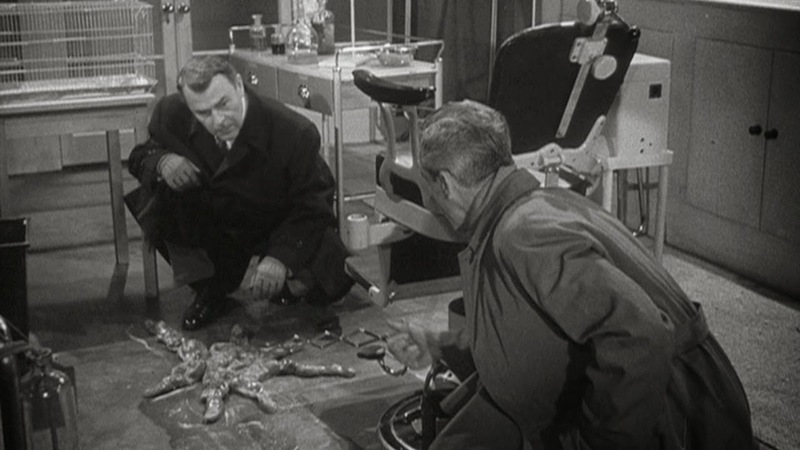 In the television serial version’s climax, Quatermass appeals to what remains of the creature's humanity and convinces it to commit suicide in order to save the world. 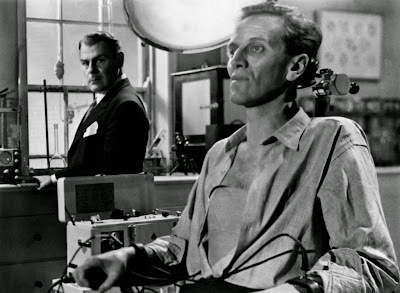 In the film version, Quatermass terminates the creature by electrocution. 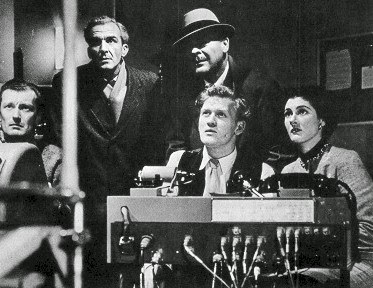 The Quatermass Xperiment premièred on 26 August 1955 at the London Pavilion on Piccadilly Circus. The film was shot on location in London, Windsor and Bray and at Hammer's Bray Studios. The film was marketed by Hammer in the U K by dropping the "E" from "Experiment" in the title to emphasise the adults-only 'X' Certificate (restricting admission to persons over the age of sixteen) given to the film by the British Board of Film Censors. 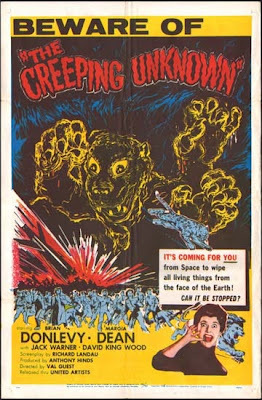 It was the first Hammer production to attract the attention of a major distributor in the US where United Artists distributed the film under the title, The Creeping Unknown. 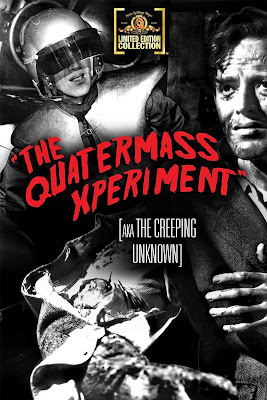 The Quatermass Xperiment was the first of these "Hammer Horrors" and spawned two sequels, Quatermass 2 (1957) and Quatermass and the Pit (1967). 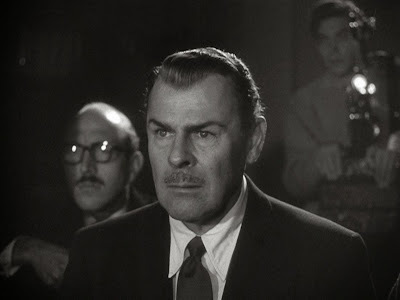 With an American audience in mind, Irish American actor Brian Donlevy was picked to play the title role of Quatermass. He specialised in tough guy roles. At about this time his career was in decline and he was reportedly suffering from alcoholism. 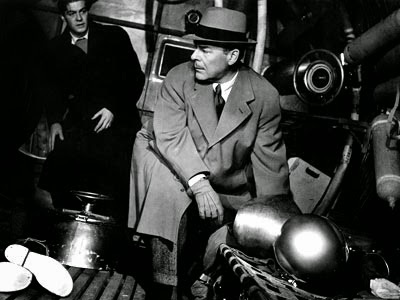 Donlevy's brusque no-nonsense portrayal of Quatermass is in contrast to Nigel Kneale's original sensitive and thoughtful British scientist character. Richard Wordsworth (stage actor and great-great grandson of the poet William Wordsworth) was cast as Victor Carroon mainly because he had the right kind of features for the part. His role in the film consisted predominantly of mime by which he effectively conveyed the kind of anguish and torment experienced by his character. Note his internal struggle at the docks where we can see that Carroon is obviously aware of what would happen if the young girl made contact with him. Makeup artist Phil Leakey worked with cinematographer Walter J. Harvey to emphasize the shadows around Wordworth's face to give him a skeletal appearance. The make-up job was made easier by Wordsworth's natural high cheekbones and hollow temples. It was agreed that the makeup should make the Carroon character appear pitiful rather than repulsive or grotesque. Director, Val Guest decided to try and make an unbelievable story more believable by creating a science fact film, something like a BBC factual documentary style of film. Adding to the pace and realism of the story, Guest employed the use of the hand-held camera, as well as rapid-fire overlapping dialogue. Guest used a wide-angle lens for shots of the rocket crash site to create a sense of vastness to the scene. Les Bowie who provided the special effects for the film, constructed a monster for the climactic scenes at Westminster Abbey using tripe and rubber and photographed it against a model of the Abbey. Sparks and fireworks were used for the shots featuring the electrocution of the creature. An eye was added to the model of the monster and a human scream added to the soundtrack to impart a sense of humanity to the creature in its final moments. James Bernard’s music score for the film employs the use of atonal strings to effectively create a sense of unnerving menace, a technique later used by Bernard Herrmann's score for Hitchcock’s film, Psycho (1960). 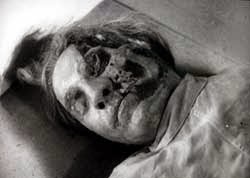 The film’s effectiveness centers around the creation of an unsettling atmosphere and what it suggests in terms of horror and terror rather than what would today be explicitly shown. Many of the shock and horror sequences take place off screen while the camera cuts away and use is made of reaction shots. 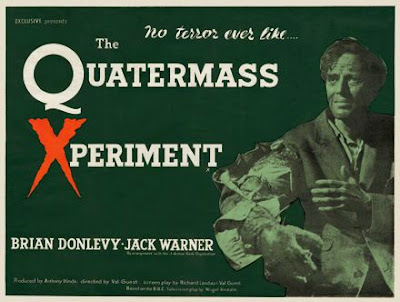 Although human progress has always been and always will be driven by individuals who possess resources, vision and imagination, we should be wary of the type of person with the kind of obsessive drive as was displayed by Donlevy's Professor Quatermass. The quest for scientific achievement must not be confused with or motivated primarily by the quest for satisfying an individual’s ego. Nor must it be undertaken without regard to the potential consequences of that quest to both those involved and to the rest of humanity.